My name is Gleeza and I love to paint. 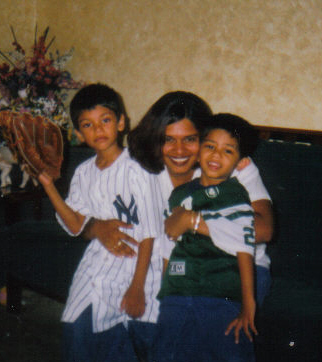 I was born in Guyana, grew up in Brooklyn and now I live in sunny Sunrise, Florida with my wonderful husband Jerry and two sons Josef and Jayson. I have always had a love for the arts, and have been crafting for the past 10 years. About 2 years ago, I saw Donna Dewberry on QVC and quickly became hooked. I bought my first book in Walmart and went to work on my bathroom walls. Suddenly I had lost all fear and hesistation when it came to picking up a brush. I found myself painting on every available surface but the walls were the most appealing and fun to me. In June of 2003, I attended the Donna Dewberry Wall and Furniture Certification Seminar in Orlando and proudly returned home as a certified DDWFS. Since then, I have started my own business and I continue to learn new methods and techniques in painting to add to my portfolio.